The fifth annaul TAB NJT20 Cricket Match 2017 was a huge success. We are incredibly grateful for the ongoing support from sponsors, players, volunteers, suppliers, donors and racing fans. 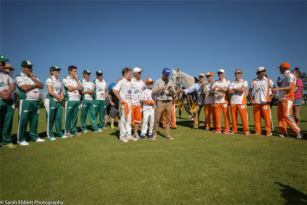 All assistance plays a vital role in the success of the cricket day and providing support to jockeys and their families in need. Melbourne turned it on this year with a clear, sunny day that kicked off with the Touchstone Farm Jockeys winning the coin toss and electing to bat. The Jockeys set the bar high with a whopping 150 runs. The highlight - star batsmen Josh Ledger & Mitch Goring scoring 15 runs in 2 overs for the Jockeys. Needless to say, the PFD Foods Racing All Stars put up a fight with AFL stars Cameron Ling, Daniel Harford and Peter Bedford all scoring double figures. The Jockeys were shaking in their size 14 boys pants, however after an epic battle, the All Stars were only able to make 133 runs with the Jockeys taking out victory in the 2017 TAB NJT20 Cricket Match. Final scores Jockeys 8/150 (3 retired, 2 not out) & Racing All Stars 8/133 (4 retired, 2 not out). Brad Rawiller was awarded the Subzero Man of the Match. Inaugural inductee into the NJT20 Cricket Hall of Fame was Jason Benbow, founder of the Cricket Match. Special mention to our Everyday Heroes, Racing All Star Mike Symons raised $4,367.95 and Jockey Luke Currie raised $1,837.50. Their efforts are an example of the incredible support received from all corners of the racing community. Touchstone Farm, Quilly Park, Rockmount, Magic Millions, Owner.Racing.com, Global Barrier Systems, Wings and Fins, LUCRF Super, The Valley, Spicer Thoroughbreds, The Big Screen Company, Victoria Racing Club, Griffiths Racing, O'Brien Real Estate, MyPunter.com, Hyland Race Colours, Markey Saddlery, Wilson Medic One, Ryan Carlisle Thomas, Deane Lester's Trackwatch, Ledger Racing & The Tile Importer. RSN Racing & Sport, Chris Waller Racing, Inglis, Thoroughbred Racing Productions, Winning Post, Austral-Asia Freight, Yarrawonga Manufactured Housing, Country Racing Victoria, Simtrack, United Syndications, Racing.com, Racing Photos, TAB.com.au, Australian Turf Club, Racing Victoria, MRC Foundation & Il Gambero. Adam Crettenden, Drew Morphett & Mitchell Faircloth. Jason Benbow, Damien Oliver, Brad Rawiller, Michelle Payne, Dwayne Dunn, Luke Currie, Dylan Dunn, Adam McCabe, Steven Arnold, Noel Callow, Luke Nolen, Steven King, Simon Marshall, Dale Smith, Brenton Avdulla, Patrick Moloney, Beau Mertens, Tom Sadler, Jamie Mott, Mitch Goring, Josh Ledger & Merv Hughes. Cameron Ling, Lee Freedman, John Salanitri, Bryce McGain, Adam White, Daniel Harford, Peter Bedford, Michael Felgate, Terry Bailey, Brad Bishop, David Gately, Clint Hutchison, Nick Quinn, Jaimee Rogers, Greg Carpenter, Mike Symons, Jake Norton & John Carlo Iuele. Ben Allen, Anthony Boyd, Ethan Brown, Stephen Brown Jnr, Alexandra Bryan, Georgina Cartwright, Harry Grace, Jordan Grob, Lachlan King & Dylan Payne. PFD Food Services, No Fuss Event Hire, Penguin Coolroom Hire, Coates Hire, Flaming Pizza, Nuoc Mama's, Refresher Truck, Sweet Forbidden Journey, Jay's Yogurt, Chuck Truck, Play City Jumping Castles, Fairy Susie, Parklands Farm, Cricket Victoria & KS Environmental. Dave Young & David Jones. To all members of the Caulfield Cricket Club, in particular Pat Lennon, David McNamara, Stephen Fallet, Leigh Gavin and Andrew Amarant who we liaised with the most to the lead up to and on the day.